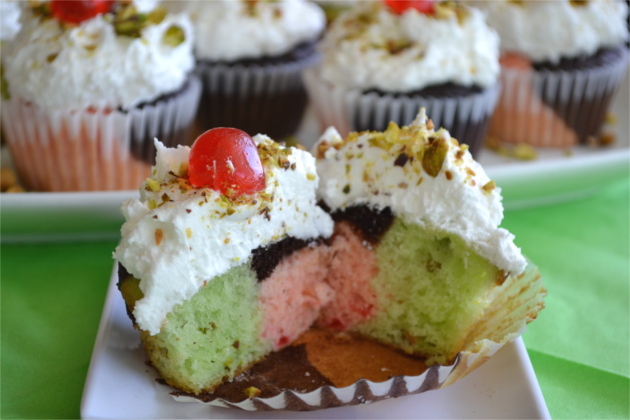 Did you know August 21 is National Spumoni Day in the U.S.? What is Spumoni? Traditionally, it’s an ice cream dessert made with different colors and flavors of ice cream, similar to Neapolitan but so much better. It’s typically made with a layer of cherry, a layer of pistachio and a layer of either chocolate or vanilla ice cream, personally I prefer the chocolate. What sets it apart though, other that the delicious flavors, are the bits of cherries and pistachios that are hiding out among the layers. Can you tell this is one of my favorite Italian desserts? Delicious! As you may know, my kids went back to school this week, so it’s been pretty crazy around her trying to get back on a schedule, but I wanted to do something special to celebrate their first full week back at school. 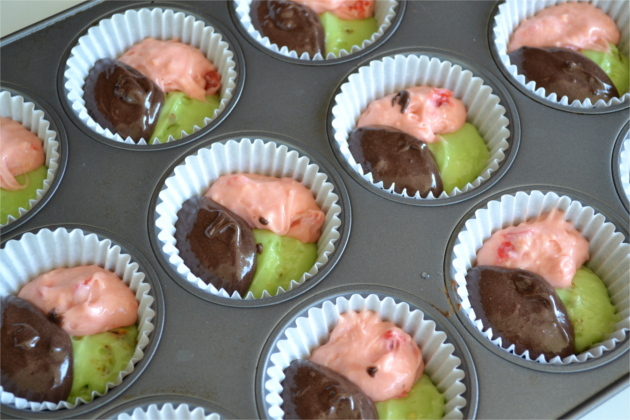 Since Friday is also National Spumoni Day I thought that I would do something to combine the two celebrations. However, if you’ve ever tried serving ice cream to 30 kids you know that would just add to my week of craziness, so I thought I would get a little creative with this traditional dessert. Cupcakes, that’s what I came up with, who doesn’t love cupcakes? They have all of the same delicious layers that are in traditional Spumoni, along with the bits of fruit and nuts, but so much easier to hand out to 30 kids than ice cream. To make them look more traditional, I topped them with a dollop of thick coconut buttercream frosting, nuts and a cherry. It may not have been ice cream but they sure looked like it. Before I go any further, you need to know that this recipe makes a LOT of cupcakes, about 72. Normally, I would have tried creating this recipe from scratch, but due to the craziness of the week I took a much deserved short cut and used boxed mixes. As you know a boxed cake mix makes about 24 cupcakes, and since I needed to create 3 different flavors I needed three different kinds of cake mix, that’s why I ended up with so many cupcakes. It actually worked out pretty well though, I had two class rooms to hand the cupcakes out to so I needed a lot. This is everything needed for the pistachio layer. This is everything needed for the cherry layer. **Oops, I forgot to put the box of vanilla pudding in the picture. And this is everything needed for the chocolate layer. 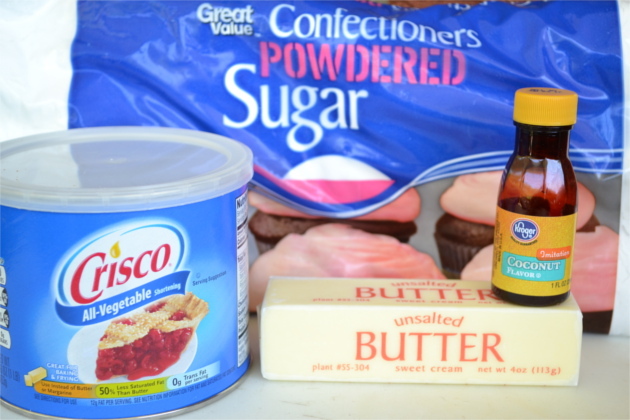 Oh, and let’s not forget about what’s needed for the delicious Coconut Buttercream Frosting. Once you’ve mixed up each flavor of batter (the directions are below) you’ll drop about 1 tablespoon of each into your cupcake tin like this. Isn’t it pretty? Then you’ll bake them in a 350° oven for 12-15 minutes. Be sure to watch them closely, as soon as they start getting golden on the top, it’s time to take them out. If they do get a little golden, it’s fine, they taste just as good they just don’t look as pretty. And this is what you’ll get! I love the way that they looked when I pulled them out of the oven. I almost didn’t want to put frosting on them because they looked so good, but there was no way that I could pass up using coconut buttercream frosting. 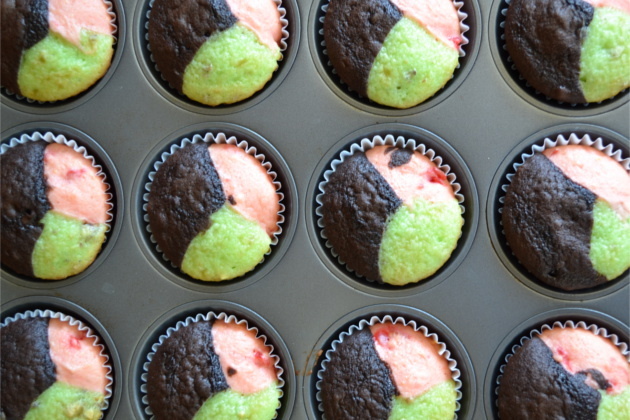 Once the cupcakes have completely cooled, you can add the frosting and toppings. Don’t worry about being real neat with the frosting you want it to look like a dollop of whipped cream on an ice cream sundae. Made with a layer of cherry, a layer of pistachio and a layer of chocolate with bits of cherries and nuts. Topped with coconut buttercream frosting. Heat oven to 350°. Place paper liners in muffin tin. 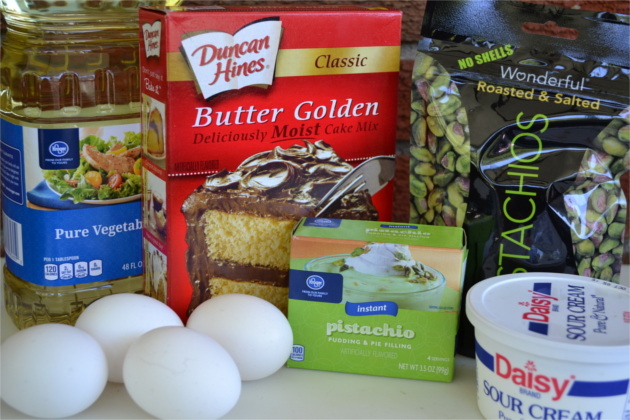 Beat cake mix, pistachio pudding, sour cream, eggs and oil in a large bowl on low speed until moist. add food coloring and beat on medium speed for 3 minutes, scraping bowl occasionally. Fold in nuts and set aside. 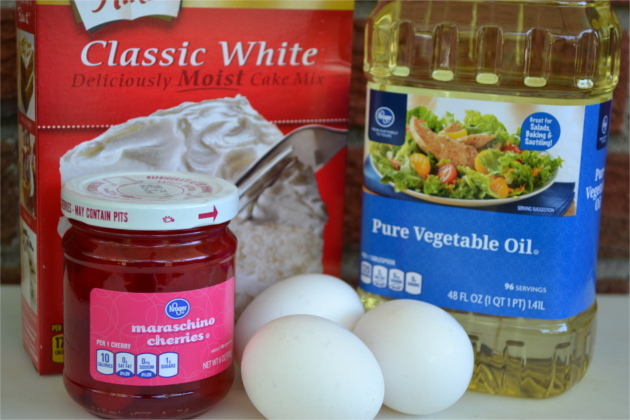 Beat cake mix, vanilla pudding, eggs, oil, juice from cherries and water in a large bowl on low speed until moist. Add food coloring and beat on medium speed for 3 minutes, scraping bowl occasionally. Fold in cherries and set aside. 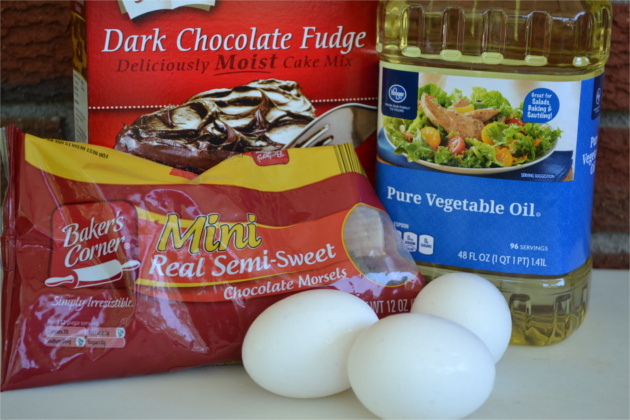 Beat cake mix, eggs, oil and water in a large bowl on low speed until moist, then on medium speed for 3 minutes, scraping bowl occasionally. Fold in chocolate chips and set aside. Beat Crisco and butter on med-high speed until fluffy. Lower speed to medium and add coconut flavoring. Gradually add sugar and milk, continue mixing until light and fluffy. Fill the muffin tin with about 1 tablespoon of each batter (as pictured). So, what’s your favorite Italian Dessert? Hi Robin. I need your help re this recipe. I plan on making them but will be taking 3 doz to work and 3 doz to an event the following day. How do you recommend I split this? Divide the recipe & prepare next day? Divide & frig half the batter? Or bake all 72 and store 3 doz for next day (frig or room temp in air tight container or zip log bags)? I would make them all at once and then refrigerate them. I just wouldn’t put the frosting on them until you are ready to serve them.